Khalil Cavil was just doing his job as a waiter at a restaurant in Texas, when he said he noticed a customer left behind a hateful message instead of a tip. 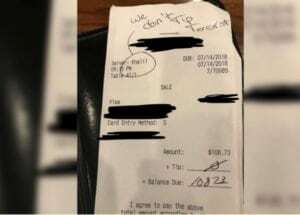 Cavil, a Black man, took to social media to share a disturbing note left on a receipt by the customer which read: “We don’t tip terrorist” on an $108 check at the Saltgrass Steak House in Odessa, Texas. That hurtful note was a gut-punch to Cavil. The 20-year-old was working to save up for school where he planned to attend Dallas Baptist University later this year, reports the NY Post. “At the moment I didn’t know what to think nor what to say, I was sick to my stomach,” Cavil posted on Facebook. The Facebook post has since gone viral with more than 17,000 shares as of Thursday and nearly 7,000 comments. Cavil said he decided to post the hateful message to fuel his vision to become the change he wants to be. “So to all the haters out there, keep talkin’, [you’re] only helping me step into my destiny!” Cavil’s post continued. The restaurant’s COO Terry Turney has taken a proactive stance in support of his employee. Cavil hopes that sharing this message will encourage others to speak out against hate. “People may overlook that, but I definitely hope this encourages other people — no matter what race, no matter what religion — to voice out that this kind of racism and this kind of hatred is not OK,” Cavil told the newspaper.